Dipodee is a Fairy-type Pokémon. It does not evolve. It has a 1 in 256 chance of appearing with a four-leaved tail, rather than a three-leaved tail. Although physically weak, Dipodee is a slippery little Pokémon. It outsmarts predators using its fey tricks and supernaturally good luck. It hops across meadows on its long back legs and hides in clover patches. To catch one with a four-leaf tail is considered a good luck charm. 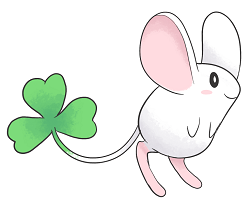 Dipodee is based on a jerboa and a four-leaf clover. Its name comes from serendipity combined with dipodid, a family of rodents that jerboas and other jumping rodents belong to.